I'm doing First Chapter First Paragraph Tuesday Intros, hosted by Bibliophile by the Sea, in which you post the first paragraph of the first chapter of the book you're reading (or going to read). 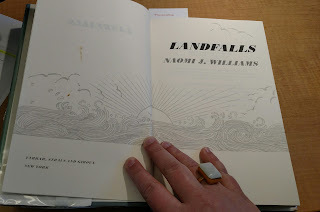 My excerpt today is from Naomi J. Williams' stunning and fabulous Landfalls. This is a reread for me; I first read this when it came out in 2015 and uh-dored it, and to my great delight, my book club picked it for our read this month, thus giving me an excuse to dive back in. No one knew what to make of the new galley stoves when they arrived. There were two -- one for each ship -- and they came by boat, first for the Boussole and then for the Astrolabe, disassembled into their cumbersome components and accompanied by a foul-mouthed shipyard locksmith charged with installing them. What are you reading right now? Share your intro with me! Audra, this makes me curious for more since you liked it so much and the intro is good. I don't read much historical fiction these days but would give it a try. Hope your book club likes it as much as you did.